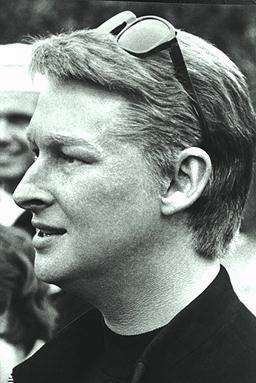 (Hollywood) Mike Nichols, whose first film, Who's Afraid of Virginia Woolf?, focused on the disappointments of middle age, has not started work on his second picture, which deals with quite a different theme - the frustrations and rebellion of youth. Though Virginia Woolf won him wide praise, Nichols is approaching his second film, The Graduate, with perhaps even greater enthusiasm. "In Virginia Woolf there was mainly Edward Albee to serve," Nichols noted this week. "There was a sense of being hemmed in. In The Graduate we can open up." With only one movie under his belt, Nichols admits he is now a hopeless "movie nut." "Filmaking has gotten to me. I find myself talking about it day and night. I'm afraid that this is what I want to do for the rest of my life." In The Graduate, Mr. Nichols and his partner, producer Lawrence Turman, will be exploring a subject that has been badly exploited and mangled in Hollywood - the "youth scene." The film is about a 22-year-old boy named Benjamin who, after graduating with honors from college, is welcomed home by his proud and wealthy family - and whose life promptly comes apart at the seams. Benjamin rejects home and family, goes into a psychological tailspin and has a turbulent affair with an older woman - the wife of his father's law partner. The project, originally a novel by a young writer named Charles Webb, was brought to Nichol's attention by Turman, who was struck by the story's "pertinence to the present scene." Benjamin, says the 40-year-old Turman, reflects an important element in today's youth. "Benjamin's personality reflects a wildness, yet an underlying decency," says Turman. The fact that Benjamin is wealthy is all the more attractive, he adds. "It adds pungency to the character in relation to today's affluent society." The setting for the story is Southern California, and Nichols, a man who is not exactly bowled over by the area, plans to shoot the film on location and "show the place as it really is." The biggest problem with The Graduate is casting the three main roles, according to Nichols and Turman. They are looking for a 22-year old boy to play Benjamin, a young girl to play Elaine, a Berkley student who is Benjamin's romantic interest, and Mrs. Robinson, the "older woman" who covets Benjamin. "It's the hardest thing I ever tried to cast," said Nichols. "These people are so far removed from stock characters." Why was Nichols interested in Benjamin's story? Part of the answer, he says, lies in Benjamin's basic dilemma - that of a prosperous young man in contemporary America "who has every desirable object he could want - a young man who has just obtained an excellent education without knowing its purpose." The crux of the film is Benjamin's emerging awareness that there is something totally wrong with his life. "Benjamin has been surfeited with objects," the director said. "Even his girls are regarded as objects. Benjamin himself has become an object to his family. In the end the only thing that can save him is some uniquely personal experience - something to arouse his passion." Though some young directors have been both stunned and inhibited when their initial ventures earned immense success, Nichols does not seem to suffer from that ailment with Virginia Woolf. "Success can only be harmful when you start believing what people say. This doesn't worry me. My friends have never especially liked any of the things I've done. They've always given me plenty of criticism - I suppose that's why they're my friends." "In any event, I always reason that the worst thing that can happen is that I fall on my face. Success may be glamorous but there is also a certain glamor to ruin. And in the end, what difference does it make whether you succeed or fail as long as you have done what you felt like doing." Nichols, who directed such Broadway hits as The Odd Couple and Barefoot in the Park, admits that he has come to dislike virtually all his work with the exception of Virginia Woolf. "With all its problems and frustrations, Virginia Woolf is just about the only thing I have ever done that I haven't turned against at some later stage. I like what we did." While Nichols's achievements on Broadway and in films have generated a veritable crescendo of publicity, Nichols himself seems curiously detached from his press. "It only causes interference. The only important thing is that work should be done in private, not in public. I don't want to make my pictures in a publicity spotlight." Indeed, Nichols winces when the subjects of success and publicity are brought up - they are subjects he finds awkward to discuss. Once The Graduate is finished Nichols, despite his passion for filmmaking, plans to return to Broadway to do a revival of The Little Foxes. Then he'll direct the movie version of Catch 22 starring Alan Arkin. Buck Henry, who wrote the screenplay for The Graduate also is writing Catch 22. For some time Nichols has toyed with the idea of forming a sort of informal repertory company that would do both movies and TV. The company would include performers whom he especially admires - Jane Fonda, Sandy Dennis, Anne Bancroft, Robert Redford, Alan Arkin. "Whenever people do well in films, they always go off by themselves and form a company that is named after their wife or daughter or cat. They go their separate way. I'd like to find some way of joining together, not moving apart."